The VOS Production of Shrek the Musical was a smash hit – now YOU can rent the costumes and props that can help you do the same thing. Below are some of the highlight pieces from our collection – if you browse through our website further, you may find other pieces of interest – ask us about them! 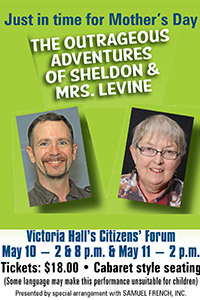 We recently spoke with long-time VOS actor Marg Kropf, who appears as one of two characters in The Outrageous Adventures of Sheldon and Mrs Levine, a dramatic reading this weekend at the Citizens’ Forum at Victoria Hall in Cobourg. VOS: Marg, you are a natural story teller and I’ll bet you use those talents in the Play Reading for The Outrageous Adventures of Sheldon and Mrs. Levine. What do you love about the art of telling a story? Marg Kropf: Yes, I definitely do incorporate storytelling into my acting. What do I love about storytelling?I am able to make myself a part of the story. When I have an attentive audience, I actually feel magically transported into the story itself. I feel the excitement building as the story progresses. I incorporate body language and movement, eye contact and vocal variety. All these have helped me bring the character of Mrs. Levine to life. VOS: Tell us about Levine. It explores a son’s relationship with his mother? Marg: Mrs. Levine is an eccentric and controlling mother who loves her son dearly. but also deep tenderness. They can’t bear to be together, but they also can’t bear to be apart. I myself have a real-life adult son whom I rarely see, and who is still trying to find himself. I can thus relate strongly to the feelings of both the mother and the son. I love the final scene of the play. It may pull at the audience’s heartstrings. It certainly pulls at mine. The Outrageous Adventures of Sheldon and Mrs Levine runs for three performances only this weekend. Tickets are $18 and are available of the Victoria Hall Box Office – 905-372-2210.